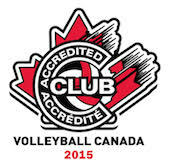 Once again the Maverick Volleyball Club as had substantial representation at the NTTCs. This summer four graduates and two incoming seniors carried the Club's colours into the prestigious competion for their respective provinces. Ontario 19U Canada Games Team had Catherine Amyot (Mavs'12), Alix Durivage (Mavs'11) and Vicky Savard (Mavs'11). The team won silver at the tournament which is a very good result for this team heading into the Canada Games next season. This marked the return to Winnipeg for Vicky who spent the earlier part of her summer training with the National Women's Team. Ontario 18U had Sophie Carpentier (Mavs'12) and Shainah Joseph (Mavs'13) on its roster and this team finished 6th after posting a 4-1 pool play record. Finally, Team Quebec Elite had Veneta Mincheva (Mavs'13) on their roster making her second appearance on the Team Quebec roster. Well done ladies and best of luck in your upcoming seasons.